There is an Ewok in the corner! Thoughts? New expansion coming?? edit: It’s called Endor Defense Station! Not really a competitive skirmish player, and I really never dug the ewoks. But I AM PUMPED!!!!! Bring on more content!!! Not to burst any bubbles, but this skirmish map is from the Captain Terro expansion. The ewok art is rather curious, but I wouldn't read it as a sign that a new box is coming. The ewok art is rather curious, but I wouldn't read it as a sign that a new box is coming. I wouldn't say it confirms a box per se but it's definitely alluding to some ewoks in some form or another coming down the line. We got the same thing for Not-Rex when they showed it on the skirmish mat on the Worlds prize support preview, as well as the Lothal cover art. Hopefully this Ewok content makes it in before the inevitable conclusion of the IA physical product line. God, please, anything but Ewoks! Difference was CT was definitely tied to unannounced content. 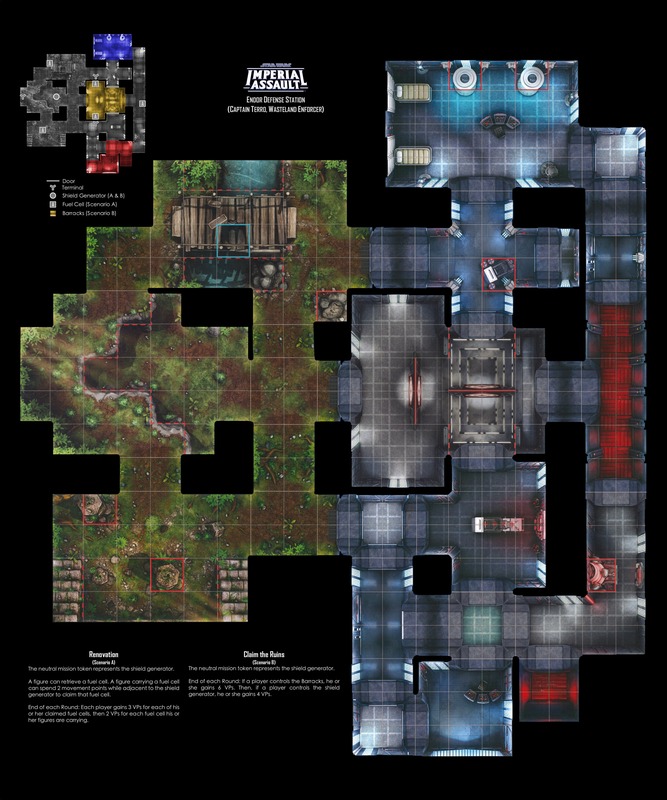 This upcoming skirmish map is rather old, even if it is accompanied by ewok art. If more ewok art show up in the world's prizes (honestly that might be the biggest indicator of the future of the game), then sure, that is probably more convincing. As of right now though, I don't think this is a sign of what's coming on its own. I don't think any of the existing skirmish mats have ever had art for a character that wasn't in IA, though. Agree. It‘s at least suspicious that they put something like this on it. Didn't they have Thrawn on some prize support mat before he was announced? Obviously this still doesn't confirm anything, but it would honestly be cruel to tease us like this if there isn't a new wave on the way, especially given how FFG is certainly aware of how Lothal was originally "teased". I'd also point out that as far as I know, no skirmish map has ever featured units on it from the same faction. Having an Alliance Ranger representing the Rebels makes me think that the ewok is probably a merc unit. It might seem strange to not have ewoks as rebels, but I've seen a lot of people predicting that for a while anyway, and it's not that different from the loth-cats we already have. So, if the ewoks were really just art chosen for the Endor map theme and not an indication of stuff to come, why not use them on the Rebel side and use scout trooper art on the other side instead? Why create a strange situation where you have ewoks representing the merc side, when they're not even coming to the game anyway? It's all speculative, of course, but it does seem like a really strange decision to make if you're not even bringing the unit to the game. So, put me in the camp of "if I had to guess, this is probably meaningful". Standard number of heroes (2 for smallbox, 3 for big). Given the Endor theme maybe a class themed on making your units stronger when there are less of them on the board. This would work well with the "turning point" theme of the war at that time, but also with balancing the game and making tactics other than the classic swarm more viable. As far as I can see, up to now, every single character art piece that has appeared on the skirmish maps has, sooner or later, represented a game character. That's where I'm at with this, too. I mean, FFG's gonna FFG, but I've got to believe that even their marketing department wouldn't be tone-deaf enough to release this if there were no plans to eventually release a corresponding expansion. I mean I don't think I've see an IA forum/facebook page/etc. in a few months where the most talked about comments aren't some variation of "IS THIS GAME DED?". If there's nothing else coming, rubbing this sort of salt on fans' wounds would be a new level of cold. With that said, I'm still not convinced that there's anything immediately forthcoming like there was last time with CT/Thrawn. The fact that we're getting an old map - and not a new one like we saw in that case - makes me thing that there's nothing imminent. But, even more so than before, I'd be very surprised now if they don't eventually release another box. I'd also point out that as far as I know, no skirmish map has ever featured units on it from the same faction. Nal Hutta Swamps has Fett and Vinto on it. 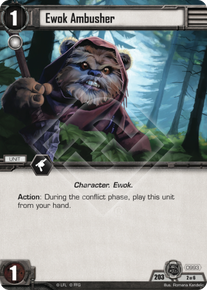 If we don't get Ewok's then this is a horribly painful troll by FFG. The old kickem while their down. I will remain positive and look at it as a sign of physical content, whether it is a box or a blister pack, something is coming. Hmm. I guess that works, though I think Vinto is kind of a weird case in that he could also be considered a Rebel. The ewok picture gives us at least (and last) something to talk about and the speculation is on fire. We have been expecting an Endor expansion long enough. Hopefully it's a hint and they'll announce something soon, at Worlds maybe? Pure speculation, but what if the reason they have been so slow with releases is because they're gearing up for a second edition of the game? An Endor release could cap off the first edition, and the third movie of the new trilogy can herald the new app-based Imperial Assault (or First Order Fight?). It's all pure speculation, and probably wishful thinking. EWOKS are coming. this confirms it. I keep telling our group that we need to dive back into some of these older maps. There were a bunch of Bespin and even JRealm maps that got passed over just because how they rotated things that were good, fun maps. So let's say there is an Endor box- what could the blister packs be? Part of the challenge comes in assuming that any Endor campaign would likely be after the Battle of Endor itself. For Mercs, I guess it's high time 4-LOM and Zuck came to shine. It fits in well with the recent focus on double packs, and they might as well be in this campaign- it's not like the mercs had a really heavy presence, anyway. The Empire's best bet would probably be Inferno Squad. I can't really think of anyone else. I know Yoda is a popular pick, but from a campaign standpoint I just don't see it. I wouldn't mind Yoda in almost any other campaign, but the one that would presumably be after his death just seems poorly planned. I'm not a big fan of Solo or Leia getting new versions, either, as they just seem unnecessary. The changes they go through aren't quite as transformative as Luke's- or at the very least, not transformative in the same way. Ackbar or Antilles could be fun- I guess this could be a whole "mop up Endor" kind of thing, with Wedge or the admiral being shot down and needing to hold his own on foot. Anyone from Rogue One seems unlikely, since they'd all be long dead by Endor. Same for Solo. Comics characters could conceivably be there, but there'd be an implication that they survive to that point, which as far as I know hasn't been proven for anyone. I feel like some of the easiest characters to incorporate would be some relatively obscure ones like Kess Dameron. I guess, lame as it sounds, the most likely ally for the Rebels would be a generic trooper group. OR, though I seriously doubt it, maybe that's wha the Ewoks are. OR, super big plot twist- the art is for an Ewok hero, and we're all totally off base, and this was just meant to throw us all off. Ewoks have been represented in the art for a while now. Efficient Travel command card has an Ewok on it. I think the Ewok is there to reinforce the 'Endor' effect rather than as some mysterious prelude to a new box-with-ewoks. I do like this map! Seems to be nice combination for indoors/outdoors, mid-long range and short-mid ranged operatives. Looks like a solid tourney map to me.